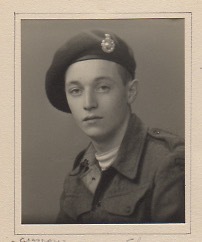 Mary’s dad, Bernard Kennedy, volunteered to train as a Royal Marine Commando, ‘the world’s most elite amphibious force’, aged 19 – expressly against the wishes of his parents who wanted him to wait until it was his turn to be called up to join one of the armed forces during World War II – and he said he crawled over tens of miles of the heather and bracken of the western highlands of Scotland and saw grown men cry at the prospect of crossing vertiginous ravines during their rigorous training. There is a memorial commemorating those first commandos at Spean Bridge, Inverness-shire. It was raised in that place because it is on the route to the former Commando Training Centre at Achnacarry Castle. Arriving soldiers, sailors or airmen hoping to train as Commandos would disembark after a 14-hour journey, load their kit bags onto waiting trucks and then speed march the 7 miles (11 km) to the training centre in full kit with weapon, weighing a total of 36 pounds (16 kg). Those not completing the march within 60 minutes were immediately returned to their units. Bernard was blinded by a sniper’s bullet in Arakan (Rakhine State), Burma, on March 12th 1944, aged 22. He was critically wounded but rescued by local villagers and taken to a field hospital. “… and Marine Kennedy, apparently killed. The Japanese, in the manner that they had, dragged Kennedy out in the open paddy and covered his body by fire to prevent rescue, but it was recovered that night by friends of V Force.” p 136, The Raiders of Arakan by C. E. Lucas Phillips (ISBN: 9780434436576). Bernard was, patently, not killed but lived to marry Mamie and have two children, Mary and Gerard, before dying of his progressively debilitating war wounds aged 47 in July 1969. He was one of the bravest, cleverest men Mary was privileged to know.